We Can Help You With A Wide Range Of Commercial Roof Services. Are you a commercial building owner requiring an improved roofing system? In reference to performance, installation is key to your roofing solution. If you have had experience replacing a roof early due to issues including as water ponding and leaking, you realize how important correct installation is. 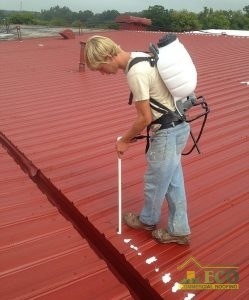 That’s why we here at ECO Commercial Roofing, ensure that each of our contractors are taught and experienced in dependable and expert commercial roof installation in Texas, Louisiana, and Mississippi. Give us a call at (833) 200-0571 to talk to any of our commercial roof experts, and learn more about why we offer better roof services to commercial buildings. Flat and low slope roof options are particularlytypical on commercial buildings, because they offervaluable storage space for heat units, as well as improved energy efficiency. Properapplication is key when pickingone of these roof styles, and without the assistance of a professional, your roofing could experience an early failure.We never take shortcuts, and our highly trainedexperts undergo further training when the industry adds to the best practice techniques. When picking the idealsystem for your building, our contractors will help you determinean answer that accommodates your budget and your needs. For business owners that have a non-traditional commercial structure, we are able to assist you with your roofing requirements for that as well! For nearly any roofing type you want for your structure, our roofers are ready to help you and operate with most price-ranges. If you need durable commercial roof installation in Texas, Louisiana, and Mississippi, your business can count on us for high-quality roofs. Pick up the phone now and dial (833) 200-0571, for an inspection and consultation for affordable and professional commercial roofing services, including repairs. Just as we have been providing professional roof services to the surrounding communities for years, we look forward to serving your business as well!